We scrolled through the long blind again. Grove Park was on here somewhere. 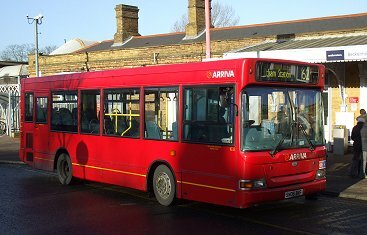 The service 162, in the shape of Arriva's Dart MPD 1632, arrived just after us. Odd to think that this smallest member of the Dart family is still a metre longer than the RT, and only eight inches shorter than an RF. We set off for Bromley ahead of the Dart, so picked up a reasonable load as we paused at Beckenham Church and stops along to Westmoreland Road. 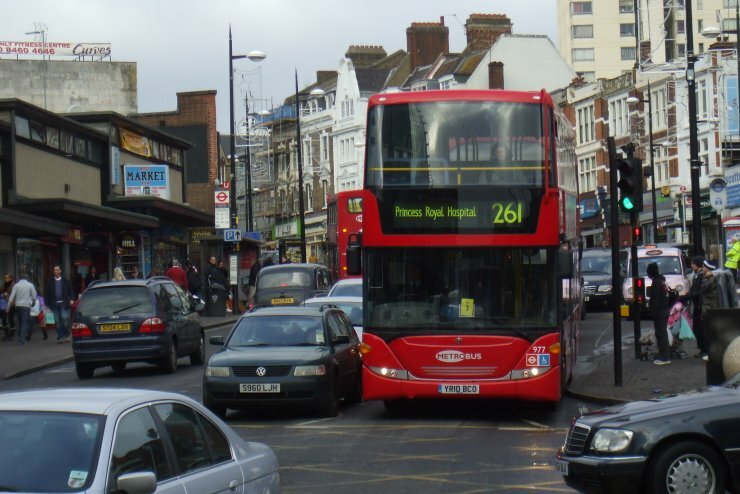 We saw another RF on the 227 as we crossed the traffic lights heading out of Beckenham. At the top of Westmoreland Road we pulled up at the stop just in front of a 138 and the 162. Someone had commented earlier on this practice of timetabling 138s and 162s to run at the same time on their common stretch of route. Most passengers joined us, but a few preferred to wait for the more usual bus. A couple with a buggy had to wait, as did those going beyond Bromley..
At the foot of Westmoreland Road we met RT3871 heading for Beckenham Junction, and I had another attemot to photograph it from inside RT3062, again without conspicuous success. 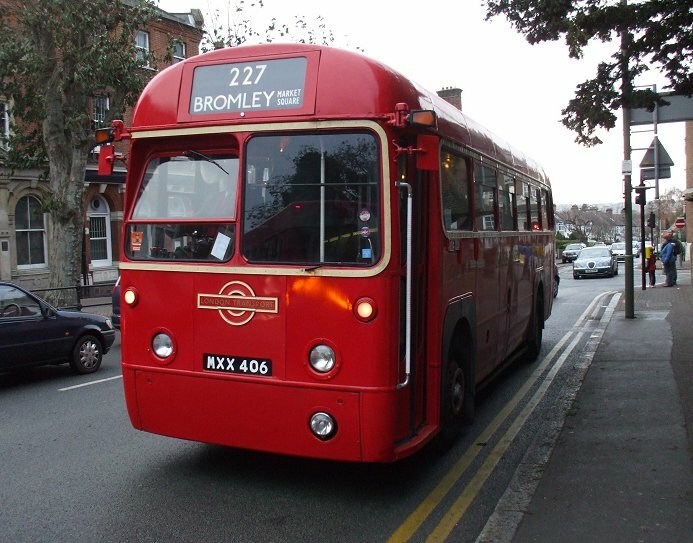 We worked up through Bromley, with passengers coming and leaving at Bromley South Station, The Glades, the Town Hall (Widmore Road) and West Street. Everywhere there were smiles and sounds of appreciation, "Can we go upstairs? ", "Cool", "Aren't the seats comfortable! ", "Doesn't it go smoothly! ", "Oh, this does bring back memories", "Can we have these back? ", "Is it really sixty years old? ", "It is nice to have a conductor". We continued to Grove Park, well loaded. I indulged myself with another photo at my "home" stop at New Street Hill. 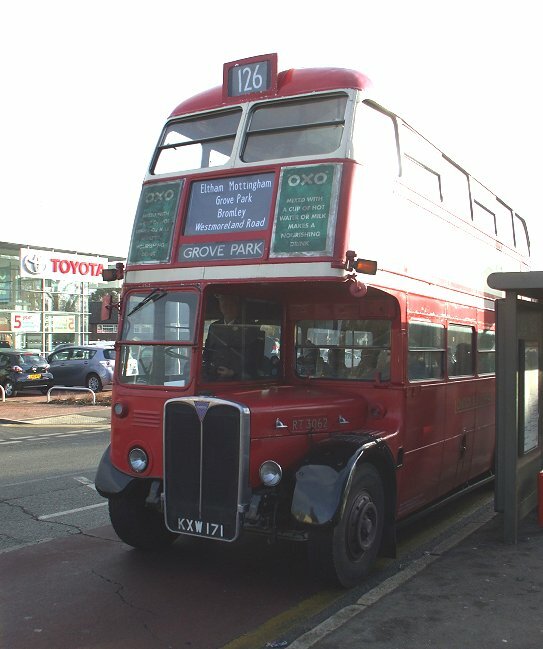 Then we were unloading at Grove Park Station, and pulling forward through the lights to the bus station, established when the trams ceased running to Grove Park in 1952. 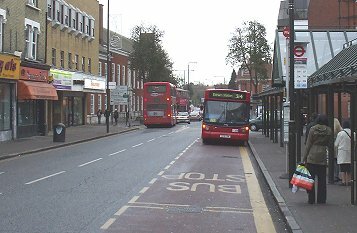 Grove Park Bus Station has bus stops in it these days. After unloading our remaining passengers we looped round onto the central stance for a few minutes. 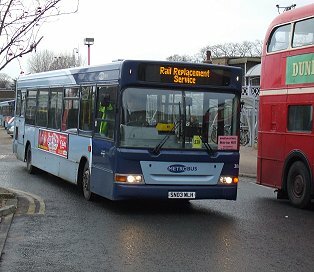 Other drivers expressed an interest in the RT. One couldn't believe the narrow climb up into the cab, and declined an offer! Buses came and went. 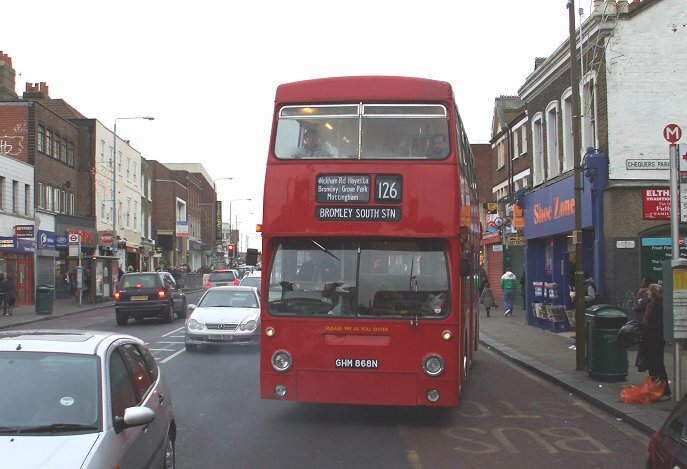 Trident 17475 arrived on the 136 from Peckham - sole remnant of the three tram replacement routes of 1952 (69, 149, 179). A pair of Scania OmniTowns rested between trips on the 181. 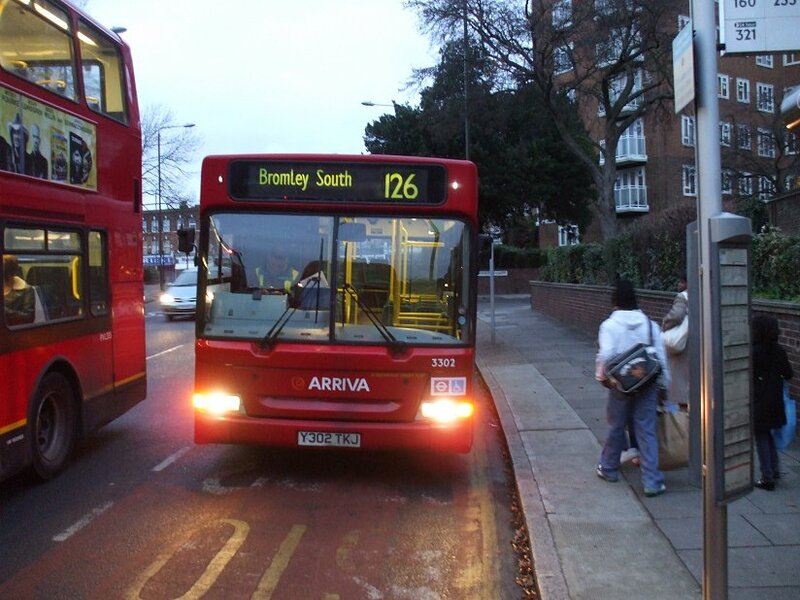 We were due out on a short-working to Bromley South. We didn't have that on the blind. 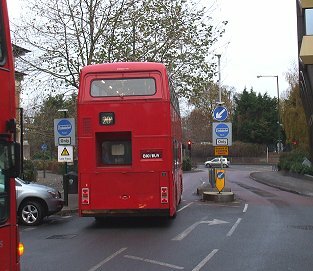 I think that Bromley South was not a terminal point in RT days, as there was then no place to turn safely. We put a blank up, and I announced our destination at stops as we headed south again. Passing down the backside of Bromley on Kentish Way we met RT3871 again, and I took a picture from the rear platform as it passed. A little further on, as we passed Bromley South Station, it was DMS1868's turn to head the other way on a 126. There were of course plenty of modern buses about, even on a Sunday: I think all of Bromleys routes work all days. 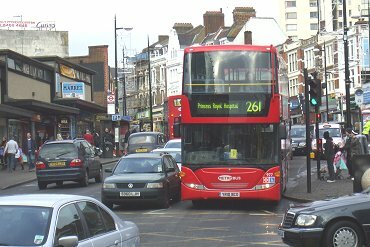 Metrobus' Polish-built Scania OmniCity 977 followed us down the hill past Bromley South Station, on its way to Farnborough Hospital. None of us had actually been to Bromley South terminus before. We knew where it was, but not what it was like. We turned right at the foot of Mason's Hill, then right again, off Westmoreland Road - and found a little turn-round layby and roundabout. We knew we did not have Eltham, on the front destination blind, but what did we have? No "Plumstead Common" either, but there was a "Plumstead, Woodlands Estate" (from the 192?). So we put that up. 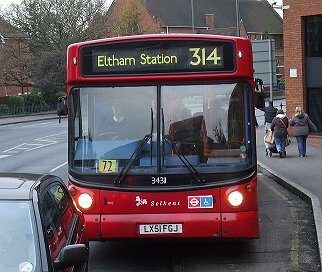 We set off for Eltham. 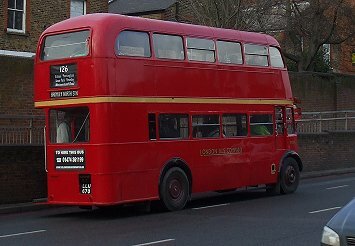 As we stopped opposite Bromley South Station two "heritage" services came down the hill. RT1702, still with GB plate, was on the 94 to Petts Wood Station, while T1101 was on the 47 to Farnborough. "Was that really a 94?" someone asked. 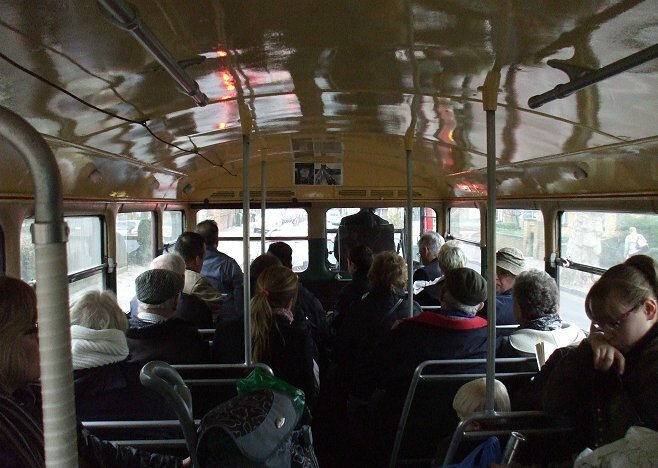 We loaded up more as we headed up through Bromley, until there were standing passengers inside. 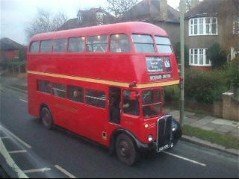 In Widmore Road we passed Dart/Alexander 34312 on the 314 to Eltham via Sundridge Park and Elmstead Woods, a route that was more or less bicycles only when I was a lad, before it acquired FS microbuses as the B1. Running out to Grove Park we dropped a few passengers, but still had a good load when we got there. Some got off, others got on: "Via Grove Park Road, not Dunkery Road!" Some good-natured lads rode just a couple of stops to get off at Marvels Lane, just for the experience. "Cool" - and they didn't mean the temperature. We arrived at Southend Crescent to find DMS1868 already on the stance. They were on time. We were still running half an hour late - and shouldn't have been at Eltham anyway. The DMS set off first, on its way to Bromley South, but we overtook it at one of the Eltham High Street stops. 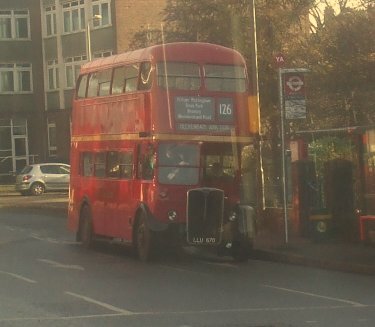 In turn it went past us at the stop by Eltham Church. Between the two buses we split the load. One of the passengers was very enthusiastic, and couldn't wait to phone her husband to let him know what she was doing. 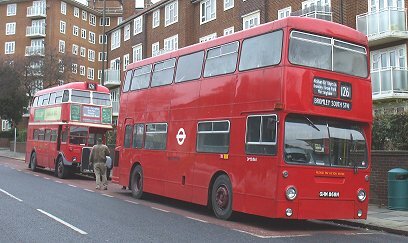 She was ecstatic when she found out that she could change onto an RF for the rest of her journey, either in Bromley or at Beckenham Church. 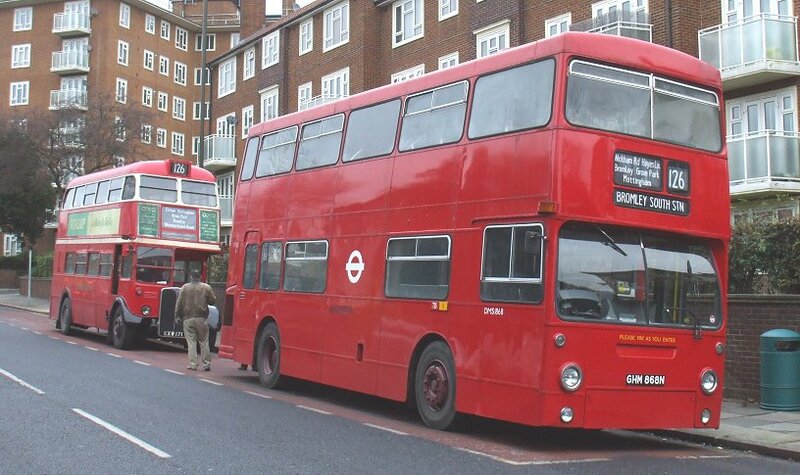 We made good time down to Mottingham, and turned right for Grove Park Road. We paused outside Eltham College for a photo. 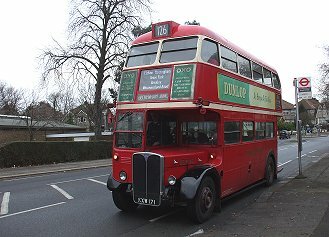 Then it was on to Grove Park and Bromley. 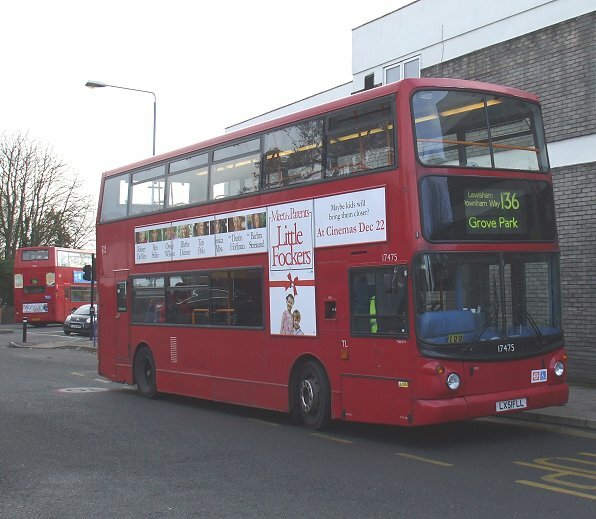 At Bromley North Station we saw RF486 pull away ahead of us, starting another journey to Penge. We also picked up its previous driver, who had just come off duty and was taking a busman's holiday with us! Passing through the Glades we passed T1101 again, heading for Catford with a 47. We met RT3871 again as we scooted down the hill from Bromley South to Westmoreland Road. 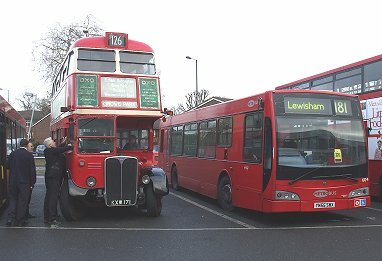 At Beckenham Junction there was another crop of Metrobus' Railway Replacement buses (I don't think they actually replace the rails). 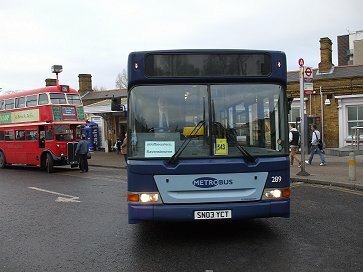 Crawley Dart 289 was heading for Ravensbourne, 206 for Herne Hill via Catford. We found the Plumstead destination blind again, and set off again. As we rounded the corner to Beckenham Church I saw an RF coming up the bank from the High Street. 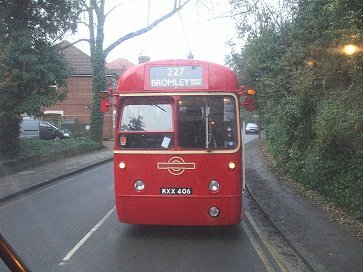 It was RF429 again, on a short working to Bromley. 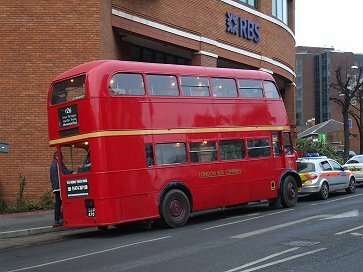 There was a number of exchanges between the buses. The RF followed us along Bromley Road to the traffic lights where our routes diverged. We had a good run via the Chinese Garage to Westmoreland Road. We showed 27mph on the roadside speed indicator! The two policemen and two church workers alighted, and we took on more passengers for Bromley. At the foot of Bromley South Selkent's 34311 came up behind on a 314. 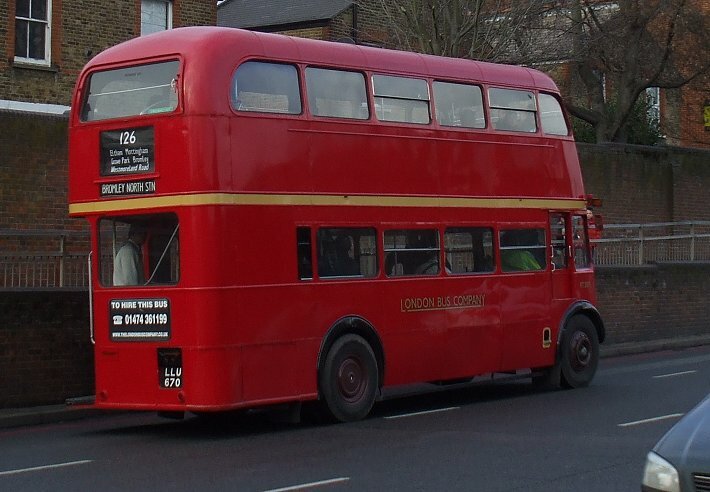 It seems to be a regular on the route. 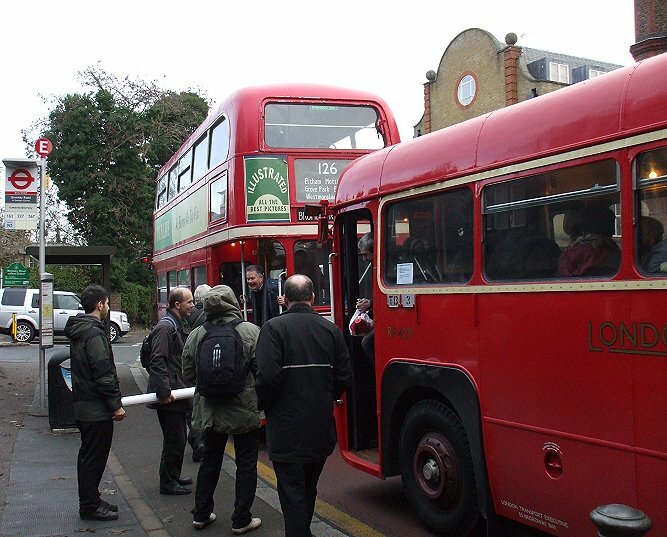 We took on more passengers in Bromley, leaving well-laden again. They included a group of young boys, who were lively, interested in this novel experience, and who took up more of my time and attention than I needed. The light was fading as we approached Grove Park. 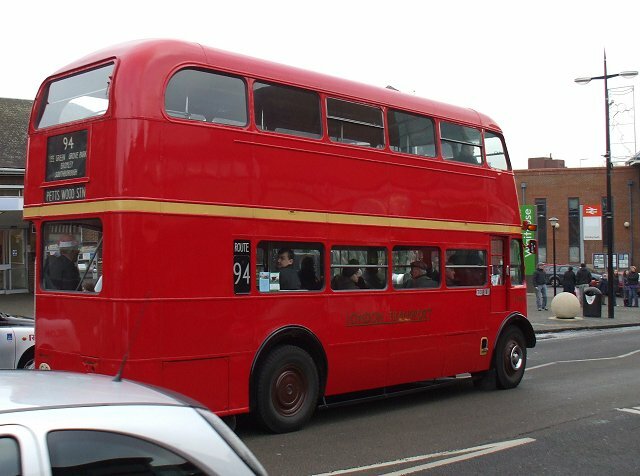 But at the Launcelot Road stop I saw a Routemaster coming the other way. 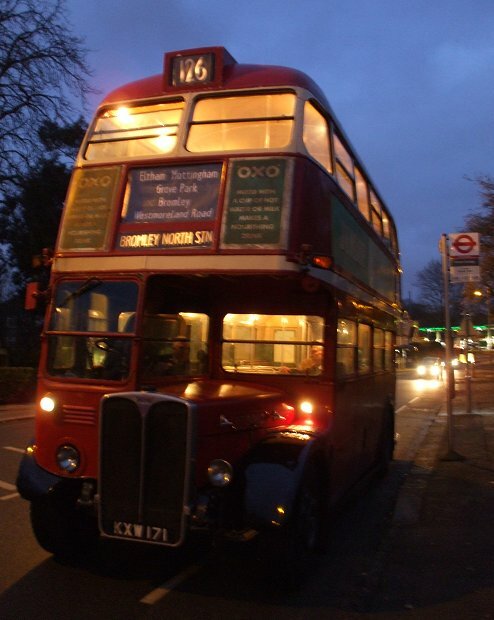 It was RM1799, heading south on a 94 for Petts Wood. 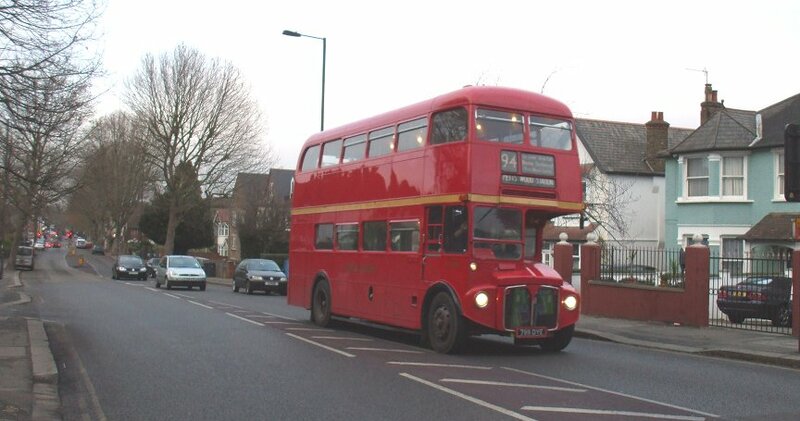 We continued towards Mottingham. I was upstairs, monitoring the passengers, when RT3871 passed by once more. 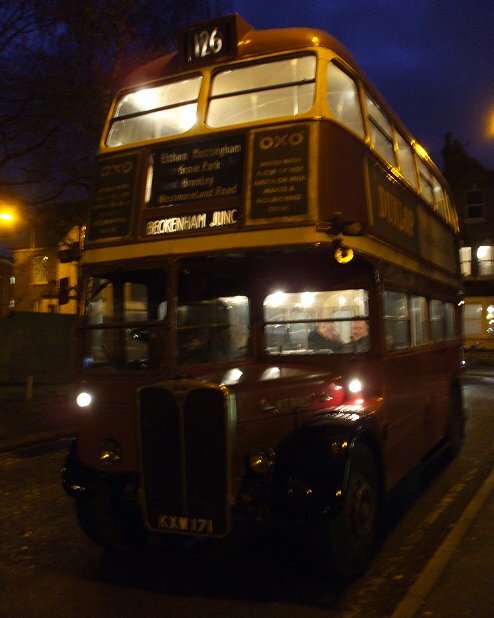 We dropped off our remaining passengers at Eltham High Street and went round the corner to Southend Crescent. We were still a half-hour behind schedule, as we had been all day. But we were all tired and cold. John and I left Colin in the bus and went to buy some takeaway coffees to warm ourselves up. 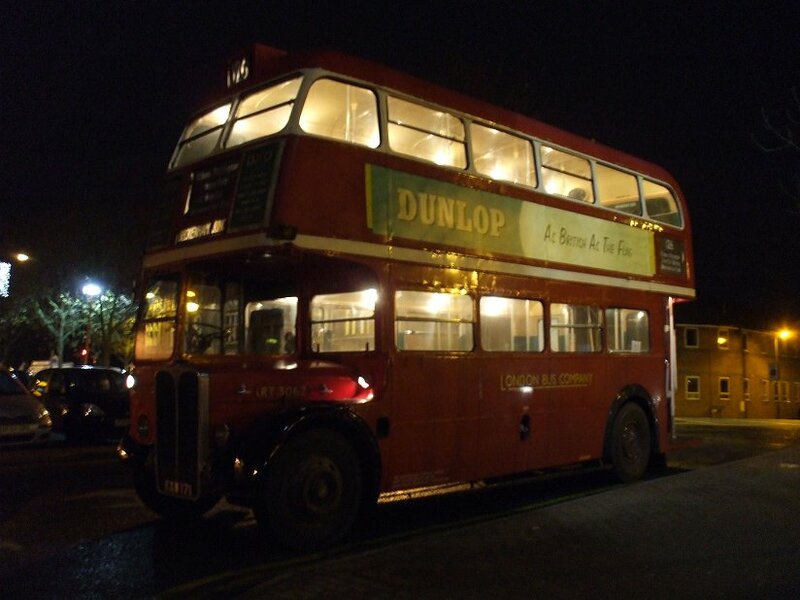 It was well-dark when we arrived back at the bus. We had to make contact with the ferry driver from The London Bus Company, so decided on a short journey to Bromley North Station. I chatted briefly with a driver on another 126, who was on Dart 3302, my then Bus of the Week. He had chosen to stand here rather than on the High Street (where I think 3293, my bus of the morning, had broken down). We found Bromley North Stn on the destination blind, and set off back to Bromley. It was a quiet run. The shops were closing and there far fewer people about now. 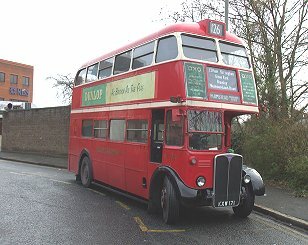 But we still had a quota of ordinary passengers for the run through Mottingham and Grove Park. 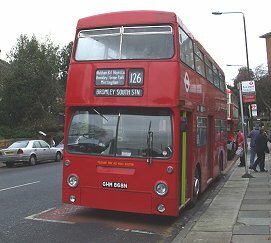 At Bromley North we pulled in to the crew change "Special Journeys Only" stop. It transpired that we had time to go to Beckenham Junction and back before meeting our driver at West Street. 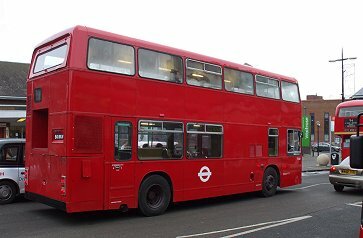 I checked the bus over, closed the open windows (I wonder who opened those? ), and we put Beckenham Junction up on the front again. We still collected a fair load of passengers going home from the shops, and fairly rattled along the now-familiar route to Beckenham. The pattern was repeated on our last journey: very quiet towards Bromley, but we loaded well at Bromley South, The Glades, Widmore Road and West Street. At the last we also picked up our relief driver, who rode the cushions out to Eltham with us. There, just after 6 p.m. we handed the bus back, after what had been a long but very enjoyable day of interacting with an enthusiastic public. 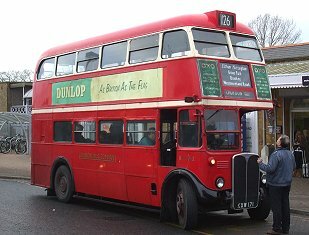 Many thanks to all the crews, bus owners and organisers who participated in the day. 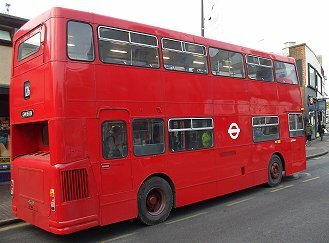 Thanks too to the bus companies and TfL for giving us permission.